A very credible account was described in 1956 by engineer J.P.F. Brown near Lake Bangweulu, Zambia and reported in the April 2, 1957 Rhodesia Herald. Brown was driving back to Salisbury from a visit to Kasenga in Zaire. He stopped at a location called Fort Rosebery, just to the west of Lake Bangweulu to get his canteen from the trunk. It was about 6:00 p.m. when he saw two creatures flying slowly and silently directly overhead. He observed that they looked prehistoric, with a long tail and narrow head. He estimated a wingspan of about 3-3 1/2 feet. One of them opened its mouth in which he saw a large number of pointed teeth. 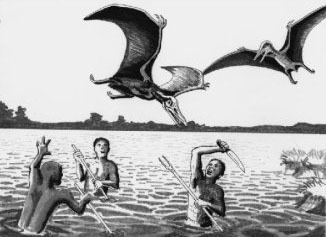 Further reports of such odd flying creatures come from the Awemba tribe that claims they live in caves in cliffs near the source of the great Zambezi River. In 1957, at a hospital at Fort Rosebery (the same location J. P. F. Brown had reported seeing strange flying creatures the year before) a patient came in with a severe wound in his chest. The doctor asked him what had happened and the native claimed that a great bird had attacked him in the Bangweulu swamps. When asked to sketch the bird, the native drew a picture of a creature that resembled a pterosaur. In 2010, Genesis Park staff mounted an exploratory trip deep into the Bangweulu Swamp. Zambian fisherman were interviewed and all-night vigils were conducted. But no definitive evidence for the existence of the Kongamato was obtained. 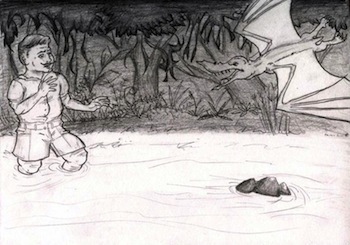 To the west in Cameroon, the natives describe a nocturnal, bat-like creature called Olitau. Likely the same as the Kongamato, this creature was observed by an exploration team under Ivan Sanderson in 1932. He drew a sketch of the episode (right). Modern reports of the Kongomato continue to surface. In 1998 Steve Romandi-Menya, a Kenyan exchange student living in Louisiana, declared that the Kongomato is still known to the bush-dwelling people in his country. The creatures are said to feed on decomposing human flesh, digging up bodies if they are not buried to sufficient depth.